Hardcover, 6.75 x 9.75 in. / 110 pgs / 14 color / 6 bw. 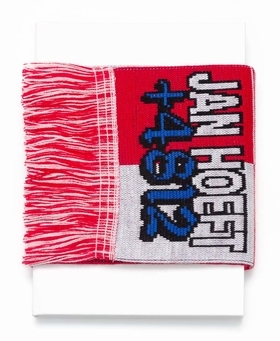 +4812 documents Jan Hoeft’s (born 1981) public piece in Kraków between two football stadiums: a football scarf mimicking the design of the two hostile clubs was placed on the side of a newly installed handrail. It was stolen each day and replaced immediately, its art context always denied. FORMAT: Hbk, 6.75 x 9.75 in. / 110 pgs / 14 color / 6 b&w.